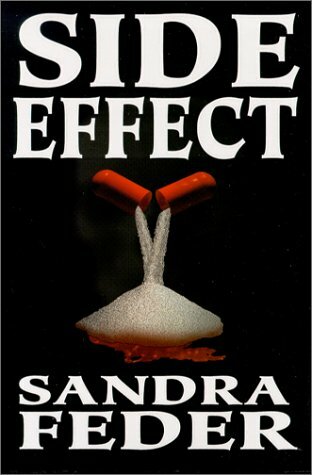 Side Effect is in the tradition of scientifically or professionally realistic thrillers, a la Michael Crichton/John Grisham, this time set in the stressed out fast-paced world of pharmaceutical research. Sandra Feder has a background in research chemistry, allowing her to spice up the thriller/whodunnit formula with "authentic" popular science explanations which attempt to give some context and rationale to the plot. Unfortunately, while Feder has a grasp on the elements which make a good whodunnit plot – suspense, fear, thrills and twists – there is no chemistry to gel them together. Grant Fraser is a research chemist for a major pharmaceutical company, working on a drug which could revolutionize the capacity of the human immune system to defend itself. However, his benign drug has a lethal twin which can have fatal side effects. Grant struggles to gain recognition for his "white twin", coming up against puzzling obstacles in the corporate structure (his boss is against him). Meanwhile, the multiple villains of the piece are using the "black twin" to further their own unsavory ends. Black versus white, good versus evil are thus easily established, and to further enhance the polarities, Grant is faced with a triad of women – his quiet, nervy research assistant; the company director’s ice-queen, power-obsessed daughter (also the twin of Grant’s dead girlfriend) and his best friend (the Company’s PR Director) who doesn’t seem to fully support him anymore. The uncertain motivations of the characters are well established from the start. In fact, it is completely impossible to know whom to trust, or to understand why any of the characters act as they do. This has a purpose – when the reader is so totally unsettled, the bizarre twists and turns in the characters’ motivations and the events do not seem so implausible. It also propels the narrative forward to find out what happens next. In the best Agatha Christie tradition, when the laboratory saboteur is finally revealed, it is the character who would have aroused the least suspicion. But another feature of the Agatha Christie tradition, is that at that point in the narrative, the pieces of the jigsaw would fall into place, and the reader would notice the signposts to guilt so cunningly hidden along the way. In Side Effect, the motivations and modus operandi of this villain are afforded about half a page and then quickly forgotten. Perhaps the reason for this is that this person is only a minor villain in a much bigger conspiracy – and that’s where the narrative loses all interest. For the discovery of who the "black twin" villains are does not give the reader a satisfying sense of closure–a seventy page chase by the villains must be endured before the hero can reach safety. Feder, at this late stage, chooses the lull in plot twists to attempt to develop her central character, but unfortunately it is much too late. No reader expects much in the way of great depth from a popular thriller, but solid, identifiable central characters are the mainstay of any novel’s appeal. The greatest failing of Side Effect is the lack of an interesting or engaging hero or villain. It is difficult to understandGrant’s frustrations and difficulties, and the villainy is spread so thin over so many characters that it is impossible to see a purpose to it. One glimmer of hope, and a possible thread to link to future books, is the character of Fred, the enigmatic, lonely, morally upright detective who functions as the external observer and interpreter of all the proceedings. Unfortunately, he is not yet a sufficiently forceful and developed presence. Side Effect might be good for a long train journey; it will keep the reader turning the pages enough to prevent staring out the window, but it leaves no lasting effect.